Let me rephrase that. I WISH my kids love Kool-Aid. Oh sure, they’ll drink it from time to time. But my kids, being typical kids, want all those bad drinks. Stuff like, water. Or maybe milk. And oftentimes they want a . . . are you ready for this . . . cup of hot tea. That’s right, my son, as part of the new generation of wild and crazy teenagers, is choosing the wild and crazy drink that teens across the globe are choosing – hot tea. And to make it even worse, he’s drinking it . . . UNsweetened. What happened to the days when your kids wanted all of the BAD things to eat and drink? The days when kids drank Cokes and Dr. Peppers all day and most of the night? And their diets of choice would have been Oreos and Funyuns? You know, the kind of stuff where you could then rationalize away whatever you were eating. “Well, sure, I ate a half gallon of chocolate ice cream in one afternoon, but at least I didn’t eat . . . ” and then fill in the blank with whatever bad health choice your kids were eating. But you have to understand my son. While he’s only 13, he’s been 35 for a while now – I’d say at least since he turned 7. In fact, I expect him to tell me that he’s become an accountant just any day now. Plus, he’s quickly becoming the adult in our house. He’s taller than me. His voice is almost deeper than mine, and he’s probably making more money than me. And here’s another sign that he might be the adult around our place. Every week, he gets excited when the new issue of Time magazine arrives in the mailbox. I, on the other hand, get excited once a month when the new issue of Highlights for kids is delivered. He’s reading about developments in the Middle East and the economy and new and exciting tweets from our President. As for me, I’m usually engrossed in trying to find the soup ladle and a bee hive in the latest rendition of the Hidden Picture section of my magazine, or checking up on the latest rambunctious adventures of Goofus and Gallant. But no matter how adult my son might be, there’s still one kid drink he can’t resist – it’s the siren song of chocolate milk. Especially Nestle Quik Chocolate Milk. Whenever, I’m stressed, I’d rather have the chocolate milk than anything. You know how some people after a stressful day come home and have a beer or some kind of mixed drink. Not me! I’m standing at the refrigerator hittin’ the chocolate milk again. Making Kool-Aid at home is easy, too. 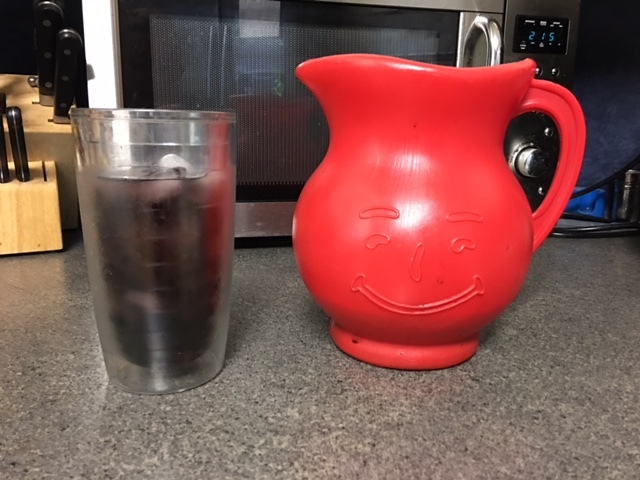 Mainly because we have one of those OFFICIAL Kool-Aid pitchers. We got it years ago. My wife was insistent. Actually, it became more of a quest. It was one of those offers companies often make where you had to buy so many of one of their products. Then you have to save the proofs of purchase. After that, you have to mail in all of those proofs in an actual envelope using REAL MAIL (this was back in the old days, you know before email and cars and stuff), And finally, you had to wait for a looooooong time. This whole chapter in the life of our family took several months. But finally the big day came. The Kool-Aid pitcher and matching cups finally arrived . . . only to disappoint my wife. I suppose after all of the anticipation and build up, there was bound to be some type of letdown. But she was expecting an actual glass pitcher, and instead we got a blob-like red plastic pitcher. But on the bright side, it’s seems nearly indestructible. The best news of all about the whole drinking-Kool-Aid-way-of-life is that now you can buy it sweetened with NutraSweet or some such thing. So you don’t even have to add all of that unhealthy sugar that my kids seem to be shunning. So you would think Kool-Aid would be something my kids would be all for. 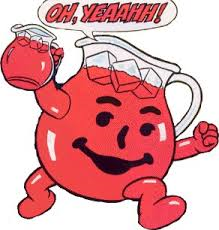 But alas, there’s only one Kool-Aid kid in this house, and for better or worse, he is me. You could ask my son about it, but I think he’s studying for his CPA. I’m not really sure though. I guess I could ask him to find out for sure. And I will . . . just as soon as I find this spool of thread in the Hidden Picture puzzle in my latest magazine. That was great! I have missed your blog posts!